Weir宣布退役，并将担任NBC的索契冬奥会解说 - Powered by Discuz! Two-time Olympic figure skater and three-time U.S. champion Johnny Weir is hanging up the skates and picking up the mic. Weir is retiring from competition and joining NBC Olympics as a figure skating analyst for the 2014 Winter Games in Sochi, he announced on TODAY Wednesday. The skating star, who is openly gay and married to a Russian man, also gave his take on Russia’s controversial Russian anti-gay laws. Weir has been opposed to calls for a boycott of the Sochi Olympics because he feels it would negate the efforts of athletes who have worked hard to reach the Games. In June, Russian President Vladimir Putin signed into law a bill banning the promotion of “non-traditional sexual relations” toward minors, which has made gay athletes and spectators worried about discrimination and possible arrest in Sochi. "I’m a gay American. I’ve married into a Russian family. I’ve been a longtime supporter of Russia, the culture, the country, the language, everything about Russia," Weir said on TODAY Wednesday. "While this law is a terrible thing that you can’t be gay publicly in Russia, I plan to be there in full support of our brothers and sisters there and not be afraid. "If I get arrested, I get arrested; if not, great, but our presence is needed. For all the Olympians that worked so hard, a boycott is just the worst thing that you could do to all these young people." In his 16-year professional career, Weir won three consecutive U.S. titles from 2004-2006, took fifth at the 2006 Torino Winter Olympics and sixth in the Vancouver Olympics in 2010. 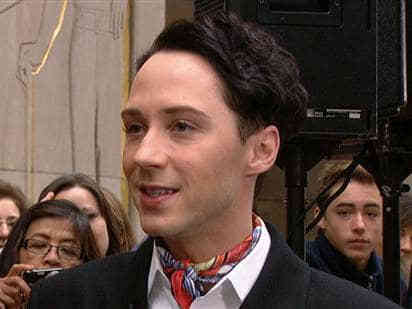 He is no stranger to television, either, as he had his own reality series, “Be Good Johnny Weir,’’ on the Logo Network. GMT+8, 2019-4-26 16:28 , Processed in 0.156124 second(s), 24 queries , MemCache On.